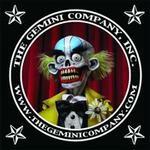 The Gemini Company is a visual arts studio that specializes in sideshow replicas and dark novelties. The Gemini Company also designs and builds creature and puppet effects for the haunted attraction and entertainment industries. Check out the videos of The Gemini Company.